A biological microscope, also known as a light microscope or compound microscope, has multiple parts that are identified in the image below. MW3-HB2 cordless binocular high school microscope. 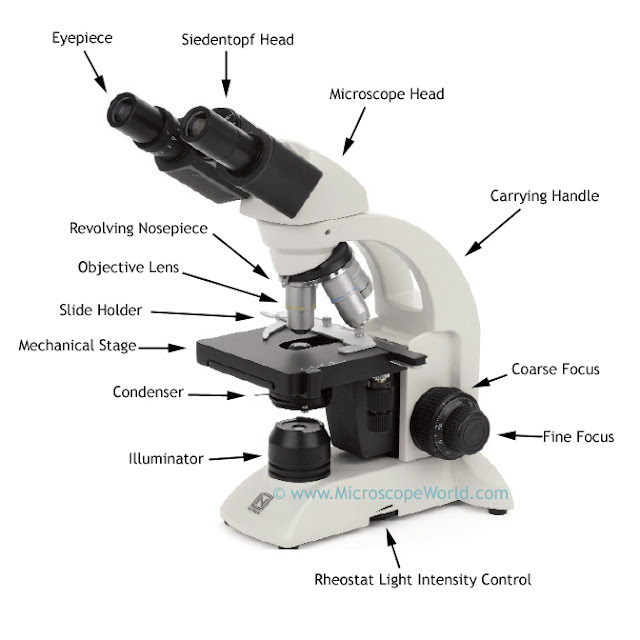 Eyepiece: Microscope eyepieces (especially in biological microscopes) are typically 10x magnification. The eyepiece might have the ability to insert a reticle into it for making measurements. Some high school microscopes come equipped with a pointer in one of the eyepieces - this makes it easier for the teacher to point out specimens to students. Siedentopf Head: A siedentopf binocular head differs from a sliding binocular head in that the eyepieces can be adjusted in a circular movement up and down, rather than simply sliding closer together or further apart. The Siedentopf head adjusts the interpupillary distance by turning (rotating) the eyetubes about a central axis (that also has the distance scale printed on it). This system is designed to change the interpupillary distance without changing the tube length, so it is "compensation-free." In other words, you do not need to compensate for tube length changes manually. The sliding binocular head, is called "Jentsch," where the interpupillary distance is changed by moving the eyetubes closer together or farther apart in a linear fashion. In this design, the tube length changes when changing interpupillary distance, so the user has to compensate for that by adjusting the "focus" setting of the eyepieces on a scale to correspond to the interpupillary distance used. Siedentopf is particularly helpful when multiple users are using the same microscope. Carrying Handle: The best way to carry the microscope is to pick it up by the carrying handle and transport it while supporting the base. Coarse Focus: The microscope coarse focus knob will move the stage (in some cases it will move the head of the microscope) to change the focus. Coarse focus moves in a larger increment than fine focus would and should be the first knob used to adjust specimen focus. Fine Focus: Once the coarse focusing knob has been adjusted to get the specimen mostly into focus, the fine focus knob does exactly what the name describes - finely focuses the image. Rheostat Light Intensity Control: This knob is adjusted in order to make the light brighter or dimmer. Illuminator: The illuminator in this particular microscope is an LED light, which is a bright, cool light. Other lights you might find in a microscope include halogen (it heats up! ), fluorescent (cool), or tungsten (also heats up). LED and halogen are usually the most common lights found in microscopes. LED light bulbs last much longer than halogen bulbs. Condenser: The microscope condenser is a lens that concentrates light from the illuminator and focuses this light through the specimen and into the objective lens. Mechanical Stage: A mechanical stage allows control of the slide without using your fingers - it consists of a slide holder and two knobs. The knobs allow for movement in the X or Y axis. Slide Holder: The slide holder is part of the microscope stage that holds the microscope slide securely in place. Objective Lens: The microscope objective lens gathers light from the object being observed and focuses the light rays to produce an image. The objective lens is also part of the overall magnification - the total magnification comes from a combination of the objective lens power and the eyepiece power. Revolving Nosepiece: The revolving nosepiece holds the objective lenses in place and allows the user to switch from one magnification to another without removing the objective lens.